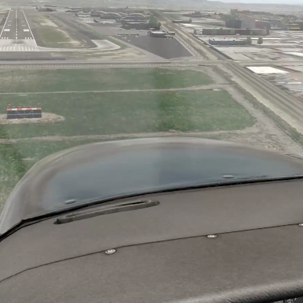 We start with a charted visual approach into Burbank airport. CVFP's are charted visual approaches established for environmental or noise considerations, and/or when necessary for the safety and efficiency of air traffic operations. 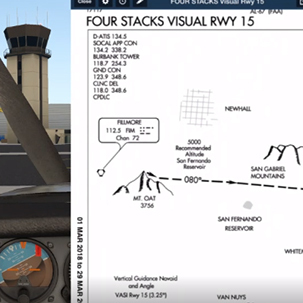 The approach charts depict prominent landmarks, courses, and recommended altitudes to specific runways. My first charted approach ever :-) Turned out to be a very scenic approach into Burbank. Will definitely re-do this one in the future. Then, the famous ILS approach. I'll fly one into Ontario International airport. This type of approach provides both lateral and vertical approach guidance. While ILS approaches make use of radio technology, newer "ILS" approaches make use of GPS technology that provide the pilot with the same lateral and vertical approach information, but with much greater precision. As such, LPV/RNAV approaches with lateral/vertical guidance are not different 'types' of approaches, but merely provide much greater precision, and thus lower decision height minimums. Note: To fly LPV/RNAV approaches, your GPS needs to be fancy. LPV: Localizer performance with vertical guidance. If your GPS has WAAS technology, you can fly LPVs (not default in Garmin 530s or 430s). 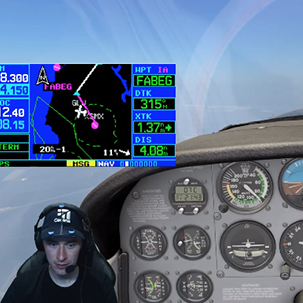 Offers localizer accuracy and a glideslope, like an ILS, but with much more precision. Also like an ILS, lateral sensitivity increases as the aircraft approaches the runway. LNAV+VNAV: Lateral and vertical navigation. Does not require WAAS technology, but does require RAIM. Unlike an LPV procedure, lateral sensitivity does not increase as the aircraft nears the runway. Glideslope information is based on barometric altitude. Sidestep: A sidestep approach is a visual maneuver to land on an adjacent parallel runway. Sometimes, a sidestep is requested or offered to facilitate an easier exit of the runway or taxi route to parking. In any case, at airports with closely spaced parallel runways at which sidesteps can be performed, a minimum altitude is usually published to complete this maneuver. 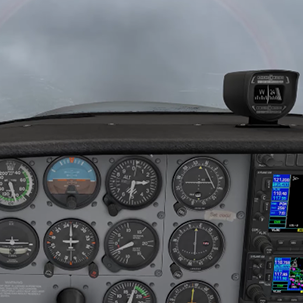 Opposed to ILS approaches, localizer approaches do not provide vertical guidance, but provide lateral guidance only (at least not via your cockpit instruments). As such, such approaches are called non-precision approaches. A bit more difficult than ordinary LOC approaches, the LOC-BC approach requires me to fly the back course of the localizer and thus to 'reversely' fly the radial. In addition, I like to practice a circling approach too. This allows me to, once at the MDA, to circle around to land on an alternative runway at the airport (if the weather permits). Let's do this at Santa Maria airport. LOC: No vertical guidance provided. Sensitivity increases as the aircraft nears the runway. There's also LP, called Localizer Performance, which works the same as a traditional localizer. SDF: Works the same as a traditional localizer. However, with less sensitive guidance. LNAV: Lateral navigation. Similar to an LNAV/VNAV procedure except no glideslope is presented. Sensitivity does not increase as one nears the runway. Stand-Alone GPS: The old-style GPS approach is pretty much the same as a LNAV procedure but restricted to using only GPS. 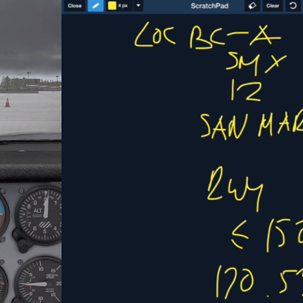 Similar to LOC approaches, LDA approaches only provide lateral approach guidance via your cockpit instruments. However, LDA is a localizer type directional aid where the localizer antenna array is not aligned with the runway it serves. If the offset angle is greater than thirty degrees, the facility is classified as a LDA. 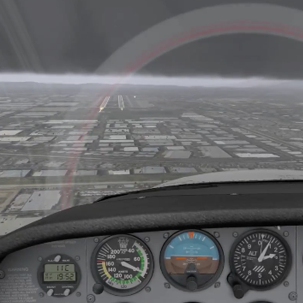 I'll do a very fun LDA approach into Van Nuys airport. What a funny approach the LDA-C is :-) Not too difficult to fly and, at night, such a scenic approach into Van Nuys. 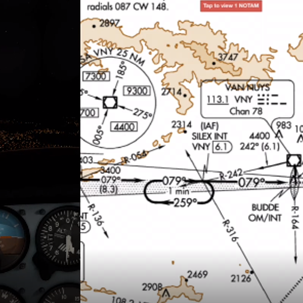 Similar to LDA approaches, VOR approaches only provide lateral approach guidance via your cockpit instruments. Also, VOR approaches typically not line you up with the centerline of the runway. VORs are less sensitive than LOC technology. We'll do one into Burbank. Time to face the mighty NDB approach and refresh my NDB radial flying practice of some time ago. Exciting. Will fly the only one in the ZLA area left, into San Gabriel Valley airport. I did great, but just a tad behind 'the ball'. There is so much to deal with during non-precision approaches. Much much fun! Just to be complete, let's fly a RNAV approach as well, into San Luis airport. These are the newest generation of approaches, GPS based, often providing full lateral and vertical approach guidance.